As soon as we heard about the new Angelus U50 Diver Tourbillon being released at Baselworld 2018, we were more than eager to see it in the metal. The brand’s first diver’s watch is simply one of the coolest diving watches out there and one that is unlike any other. But what makes the Angelus U50 Diver Tourbillon more special is the level of skeletonization of its movement allowing for maximum transparency and an incredible view of all the components in the movement including the mainspring barrel. A first for Angelus and also the watch industry, the U50 Diver Tourbillon marks the first time a diver’s watch with tourbillon has ever been skeletonized to this level. 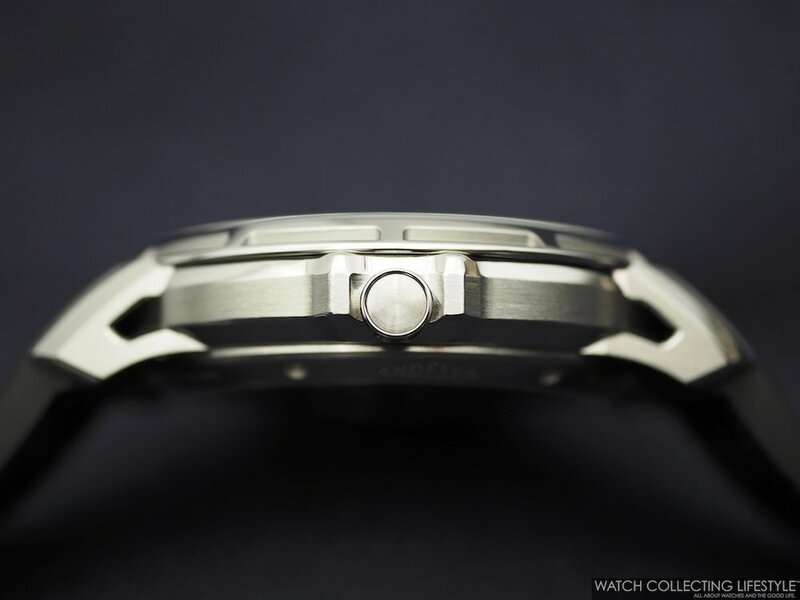 The watch features a 45 mm titanium case with two large screw-down crowns. The two-position crown at 4 o’clock is used for winding and setting the time, while the crown at 2 o’clock is used to rotate the unidirectional 60-minute flange ring. The inner flange rotates with precision and in a extremely smooth way. Opposite the crowns on the left side of the case at the 9 o’clock position, a helium escape valve is placed. The watch is water resistant to 300 meters. Instead of a solid dial, the U50 Diver Tourbillon features an open display with a highly contrasting flange ring in blue and yellow lacquer, featuring white superluminova on the indexes. Matching the legible flange ring, the hands are rhodium plated with blue and yellow lacquer, with superluminova applied in the middle of the hands. The watch is very marine looking and is by far the most fascinating diving watch out there. The dial features a running seconds indicator at 9 o'clock and a tourbillon at 6 o'clock. The Angelus U50 Diver Tourbillon comes on a very supple and well made black rubber strap bearing the Angelus “A” logo with a titanium pin-buckle. 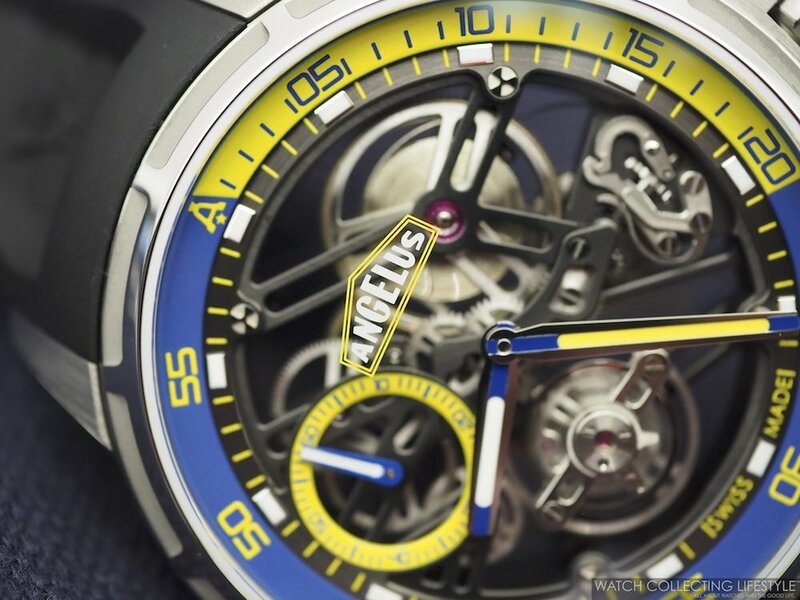 The new Angelus U50 Diver Tourbillon is available in a limited edition of only 25 pieces. The new Angelus U50 Diver Tourbillon is powered by the manual wound calibre A-300. This ultra-slim movement has painstakingly executed contemporary haute horlogerie finishing with snailed black ADLC coating and chamfered edges. The design is enhanced by a skeletonized ratchet and barrel in the exclusive Angelus six-spoke design. On the wrist, the new Angelus U50 Diver Tourbillon wears true to its size and very light. One of the nicest watches at Baselworld 2018 and an unconventional diver's watch that exudes haute horlogerie all around. Sporty, comfortable and incredibly cool. Sticker Price $32,995 USD. For more info on Angelus click here.